Today is the 30th birthday of my brother Chris, and as he has been a bit of a cycling inspiration to me, I thought I would mark this with a blog post. I’ve previously featured him in a post about mountain biking in the jungles of Borneo, and climbing unscaled peaks in Afghanistan – this boy is a world traveller and adventurer. 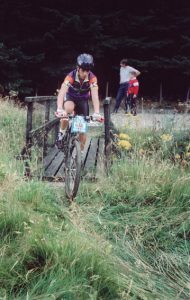 Here he is back in 1995, racing his mountain bike at Innerliethen I believe. We both started mountain biking around the same time, him on a Raleigh Lizard and me on an Edinburgh Contour 100. Although I was three years older he was generally as good as me, and quickly overtook. I raced a couple of times at Bonaly, Edinburgh up the steep climb there and round a reservoir, and bombed badly. Chris took to it much better though. He developed his bike obsession in his early years, baffling me by dismantling the bearings in his Giant on the kitchen floor. He then progressed to a Kona Lava Dome, modifying it the forks, groupset, bars, just about everything. This remained his bike for many years. Later in life, living on a tidy Swiss academic salary he got a road bike, and not to be outdone, I followed suit. I have since caught the roadie bug bigtime and this is probably the only area in which I have outdone my wee brother, in cycling terms. Happy Birthday Brother!